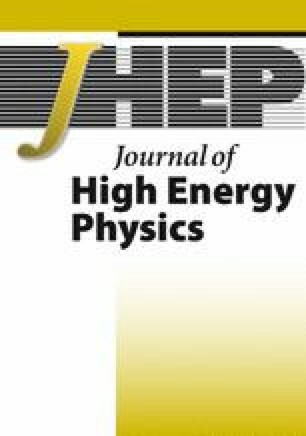 We consider the next-to-leading order thermal production rate of heavy right-handed neutrinos in the non-relativistic regime m top ≲ πT ≪ M, where m top refers to the electroweak scale. Rephrasing the problem in an OPE language and making use of different techniques than a previous analysis by Salvio et al, we confirm the general structure of their result and many of the coefficients. We also extend the analysis to the next order in the non-relativistic expansion, thereby revealing the leading non-trivial momentum dependence, as well as to NNLO in couplings, revealing the leading sensitivity to thermal resummations. Our results are expressed as a sum of simple “master” structures, which renders them a suitable starting point for determining the next-to-leading order rate also in the relativistic regime πT ∼ M.
C. Kiessig and M. Plümacher, Hard-thermal-loop corrections in leptogenesis I: CP-asymmetries, arXiv:1111.1231 [INSPIRE].